All through the school year, we waited for summer. Relaxed bedtimes, no early morning alarms and no homework seemed like Heaven. It is, really, until the kids start to realize that it’s too hot to play outside all day and that the neighborhood pool is closed on Monday! Aside from summer vacations and the occasional friend coming over, summer days and nights can be long. One way I counteract the ‘Mom, I’m so bored!’ attitude is by pulling out one of our favorite movies! I have listed 5 of our absolute favorites below but I have hundreds in my library. 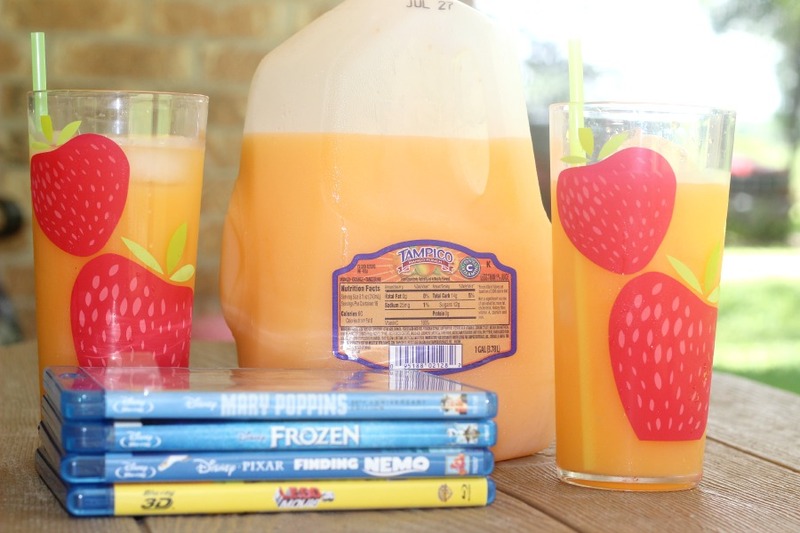 A good movie, a glass of Tampico juice, a fun snack like my Summertime Rainbow Cookies and a pallet of blankets on the floor are all we need to bust the summer boredom blues in an instant! Finding Nemo – Finding Nemo is the very first movie I remember binge watching with my kids. We had to watch it every single day! My then 3 year old, Sarah, was hooked. She would sit herself down in front of the TV for the ‘Nemo moobie’ and not move the entire time it was on. We had Nemo toys, Dory toys and more. With Finding Dory coming to theaters soon, this movie has resurfaced as a classic we all can love! The Lego Movie – When I bought this movie for my girls, I was not sure it would be liked. But as it plays in the background now for the fourth time in four days, I am reminded of the incredibly glee they had when we watched it the first time. I hear them singing ‘Everything is Awesome’ and reciting the words of the movie while they have play time. The movie has sparked a building frenzy in my kids which also helps bust the boredom blues! In love to watch this with my kids and enjoy their excitement every time a favorite scene comes on! Frozen – Yes, I said the F word! But let’s face it, this movie was a record breaking sensation for a reason. After a break from ‘Let it Go’, Olaf and the gang, this movie has made it back to the current movie choice pile. Even I find myself singing along as the well-known songs filter through the living room, little girls voiced joining in and messing up the words. The story is really amazing. A Disney movie where the prince does not save the princess is just what this mother of girls ordered. I love the message, the interaction my kids have with it and the fact that even when my friend beings her little boys over for movie night, they want to watch it too! Parent Trap – I introduced this classic to my girls last summer and to this day, they love it. Any movie where the kids seem to get one over on their parents is a true hit. The G-Rated message of family, fun and a summer of discovery about yourself as a tween is a hit with me. I love the original one starring Hayley Mills but my kids like the 1998 version starring Lindsey Lohan. The discussion of how amazing it would be to find your twin in the world is always spirited and fun when the movie is over! Mary Poppins – I can’t get through a list about family movies and not have Mary Poppins on the list. My girls and I LOVE to curl up and watch the nanny of all nannies sing, dance and entertain with a wholesome family message that has transcended decades! This movie was a favorite when I was a kid so being able to share it with my girls is amazing to me. We try to spell that Supercalifragalistcespialadocious song – which we fail at every time, laugh when the table floats to the ceiling at a dinner party and imitate the Chimney Sweep dance every time. We also share the sadness when Mary Poppins has to move on. It is a great one for any family! This summer in between playing in the sprinkler, taking the kids to the pool and driving to grandma’s, plan a healthy dose of family movie night with films everyone will love! Which movie would you add to the list?